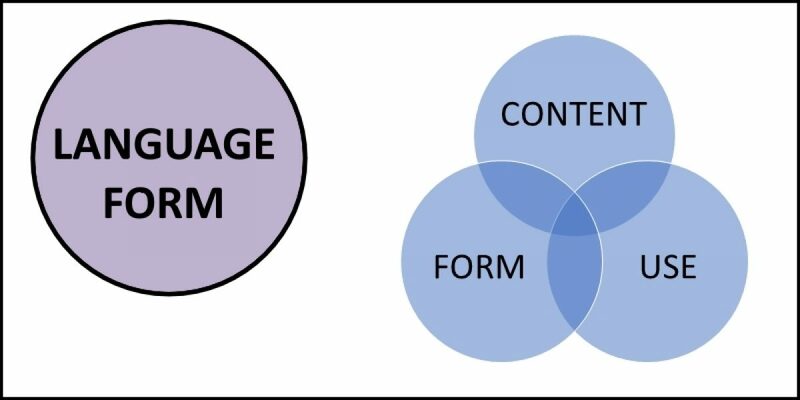 The overlap of these in the centre of the diagram below represents knowledge of language and a successful integration of content, form and use to understand and transmit messages. 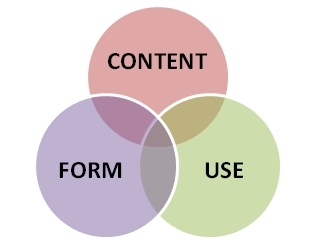 Here we summarize what is meant by FORM. In general, form refers to the shape and structure of something. It can also mean the organization, placement and relationship between things. As such, language form refers to the so-called surface features of language and how these are arranged. The rules that govern how particular language features are arranged are the grammar of the language. Morphology examines how words are formed in any particular language. It focuses especially on their internal structure and how their meaning can be altered through the addition of prefixes and suffixes. A morpheme is the smallest element in a language capable of creating a distinction in meaning, as such it is central to an understanding of morphology. Syntax refers to the rules that govern how words combine to create meaningful utterances. Morphemes combine to form words, words combine into phrases and phrases combine according to set rules into clauses. Phonology is the study of the categorization of the speech sounds of a particular language and the rule system that governs how they are used to produce meaningful words. It describes the basic unit of speech in any language as the phoneme and examines how speech sounds change when they are combined. In addition, phonology examines other surface features of speech such as intonation, stress and pausing. There are also counterparts of these features in signed language, where the range and speed of movements (hand, arm, body, face) and hand configurations and emphasis, stress, pausing, and so on. Bloom, L. and Lahey, M. (1978) Language Development and Language Disorders New York: Wiley. Lahey, M. (1988) ‘What is language?’ In Language Disorders and Language Development London: Collier Macmillan.